ALBANY, NY – If you haven’t yet heard about The Ill Funk Ensemble, it’s okay, for I am not sure how many people in this area have had the pleasure. However, they recently appeared at the Red Fox Inn in Bondville and are now starting to create quite a buzz around Southern Vermont. And… now that you know the name, checking this band out is a must for anyone who can dig a fresh combination of jazz, rock, funk, hip-hop, rap, R & B, soul and everything in between. Yes, these cats can bring all this together and make it tight as a drum! Based in Albany,The Ill Funk Ensemble has been creating their electric blend of music all over the Northeast for over five years, a five-piece, innovative hip-hop band in the vein of The Roots, a Philadelphia band from the late 80’s and known for their jazzy, electric approach to hip-hop. 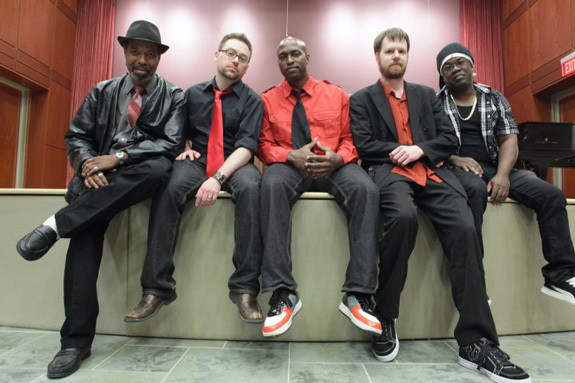 Among its’ five members, Ill Funk Ensemble combines over 80 years of jazz, rock, funk and rap experience and have shared the stage with such contemporaries as Tower of Power, Naughty by Nature, Tower of Power, The Fabulous Thunderbirds and Young MC. The band is fronted by Bronx-born singer/songwriter/rapper Jermaine Wells, a master linguist, singer and charismatic entertainer . He has appeared on MTV, the Apollo Amateur Night, Apollo Showtime On The Road and the feature film Random Heart starring Harrison Ford. The Ill Funk guitarist is BJ FitzGerald, who is a music teacher by day and has performed nearly every genre of music from rock, to jazz, country and hip-hop. He has shared the stage with such R&B giants as the aforementioned Tower of Power, famous session player “Blue Lou” Marini from the Blues Brothers and trumpeter Randy Brecker to name a few. “I came up with the idea for The Ill Funk Ensemble simply for my love of funk and quality hip-hop, and realizing that no one in the our local area had tapped this genre with a full band,” FitzGerald said in a recent interview. “When we found our lead singer, Jermaine, the pieces all started to fall together and we’ve been performing and writing our own music as well as doing great cover tracks ever since. The other members of this funk-ified band include Duane Etienne on bass and vocals, Joe Stoner on keyboards and vocals and Dennis Brooks on drums and vocals. With a unique style and electric flair, The Ill Funk Ensemble has an amazing ability to appeal to a wide range of audiences and atmospheres. They have also released their debut, full-length CD titled Catching Wreck, which FitzGerald engineered, produced, mixed and mastered at Accidental Studios in Delmar, NY. “The past five years have been such a blast,” FitzGerald concluded. Article courtesy JEM Freelance Writing. Posted in Artist Interviews, PRESS, RECENT PRESS and tagged as Catching Wreck, Ill Funk Ensemble, Interview.